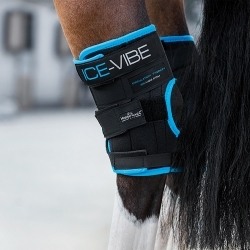 A pair of Ice-Vibe Horse Hock Boots / Wraps. 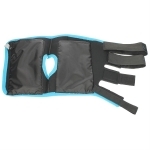 The Ice Vibe Hock Boots Encourage Flexibility, Increases Circulation, Healing and Relaxation. The ICE-VIBE horse hock boots are rechargeable vibrating boots that help to boost circulation in your horse's hock area by creating a massage effect. They combine the effects of cooling and massage therapy to effectively treat various hock issues and hock damage. The massage effect helps to stimulate the lymph system to remove soreness and swelling as well as improving circulation. Everyday wear and tear on the hock joint can be managed with daily use of the boots and rehabilitation through injury can be achieved more effectively. Easy to use, stretchy pockets allow insertion or removal of panels and cold packs with secure velcro fastenings to prevent slipping.